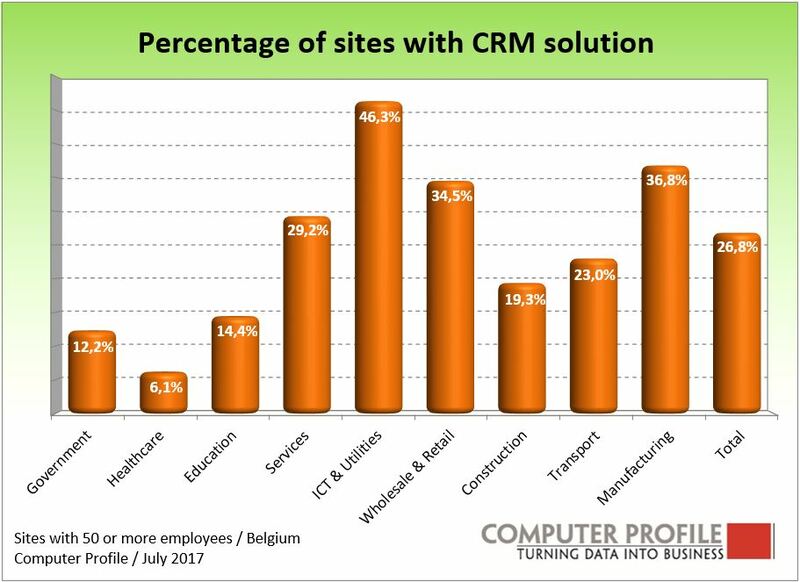 In total, 27 percent of all company sites in Belgian with 50 or more employees indicate that they use a software solution for CRM. In this, SAP is the most prevalent vendor on the Belgian market. Around 41 percent of all ERP solutions used are SAP. That is an increase of approximately one percentage point compared to one year ago. Microsoft Dynamics CRM is with a share of 20 percent the second most prevalent CRM solution. 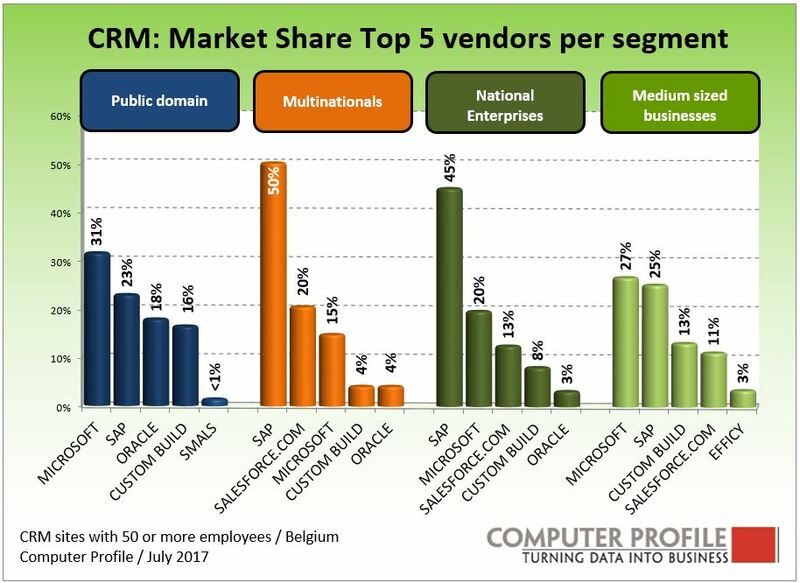 The number 3 in Belgium is Salesforce.com with 14 percent, which is a growth of 6 percentage points compared to 4 years ago. Custom solutions, too, whether developed internally or externally, are still found at 8 percent of all locations. This percentage has gradually declined in the past five years (it was 17 percent in 2013). This emerges from an analysis by Smart Profile of more than 4200 interviews that were held on-site with Belgian public and commercial institutions with 50 employees or more. In total, around 70 different CRM solutions were mentioned by the locations interviewed. The use of CRM software is equally high in the Brussels-Capital Region and in Flanders. In both regions, around 28 percent of the locations use CRM. In Wallonia, this is somewhat lower, namely 22 percent. In addition to a breakdown per region, we can also look at market segments. It then becomes clear that CRM is not used much within the government (12.2%), education (14.4%) and the care sector (6.1%). Within this public sector we do see that of all CRM solutions that are used here, nearly a third are from Microsoft. CRM use is highest at locations of Multinationals. Almost half (45 percent) of the locations use a CRM application. The supplier of choice in this segment is SAP. Of all CRM solutions within Multinationals, half are a CRM solution (frequently as part of a larger ERP solution). 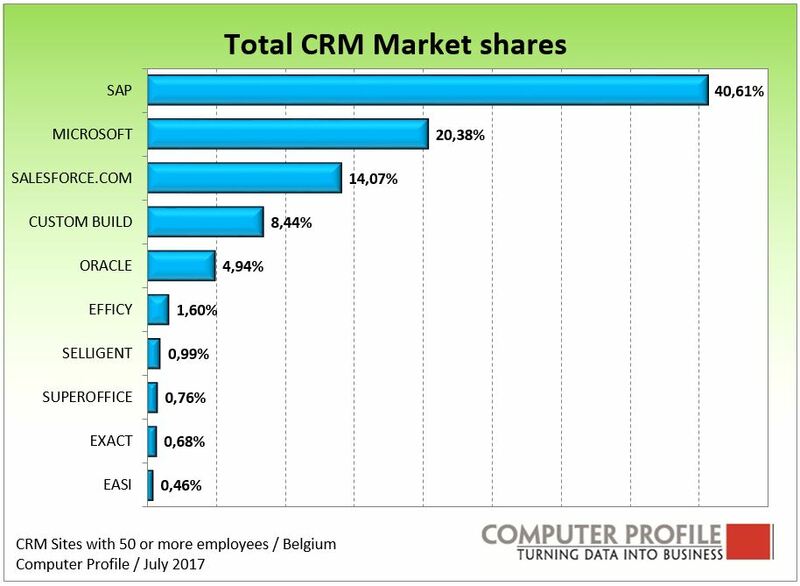 Also at the locations of the “National Enterprises”, locations of companies with 250 to 2,500 employees in Belgium, SAP is the most used CRM solution. In the segment below, Medium Sized Business which cover the locations of companies with 50 to 250 employees, the use of SAP and Microsoft CRM are almost at the same level, but we see proportionately more Microsoft CRM. With the increase in the size of a branch, in number of employees, the use of CRM also increases. At locations with 50-100 employees, the CRM penetration is 21 percent, with 100-200 employees 27 percent, with 200-500 employees 34 percent, with 500-1000 employees 32 percent and with 1000+ locations it is 35 percent. The classic breakdown according to branch gives the picture below. Exceptions to the overall market figure are the health care, where only 6 percent of the locations indicate the use of a CRM solution and the segment ICT & Utilities, where the CRM use scores far above average with 46 percent. Incidentally, for most branches, the penetration figure for 2017 is virtually the same as that of one year ago. In other words, we see that the penetration of CRM software has remained virtually the same during the last three years.